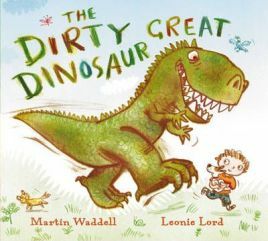 Hal, a very small boy, is playing with his dog in the garden when a roaring dinosaur suddenly confronts him. When the dinosaur announces that he is going to eat Hal, the little boy answers politely that it’s not fair to eat small children. The dinosaur threatens to eat Hal’s parents and then his dog, but each time Hal stands up to him and protests. A chase round the garden ensues, and it ends with Billy the dog and Hal tying the dinosaur up with the washing line. The dinosaur eventually has to give in, and Hal demands an apology from him. The creature also has to clear up the dreadful mess that he has caused in the garden. 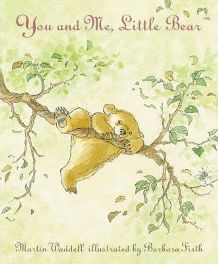 ‘You and Me, Little Bear’ is really quite a simple one, but that is good for young children. The story starts with Little Bear, like most little people, asking Big Bear if they can play together. However, Big Bear, like most big people, has a host of jobs that has to be done around the house. 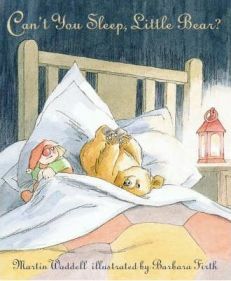 ‘Can’t You Sleep Little Bear?’ is a delightful little picture book to share with young children. 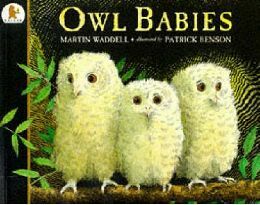 It is written by Martin Waddell who has written a number of other excellent children’s books such as ‘Owl Babies’ and ‘Snow Bears’. It seems to be that in most of his books he looks at the relationship between parents and children in a simple way that young children can understand. There is always an underlying sense of love and caring in his books, and although it sounds corny, they do give you a warm fuzzy feeling! ‘Can’t you sleep, Little Bear?‘ is no different. 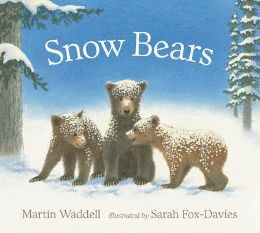 The story centres on the relationship between Big Bear and Little Bear, and on Big Bear’s efforts to help Little Bear sleep.